The spectrum of inflammatory and immunologically mediated vessel diseases (IIMVD) englobes a heterogeneous group of rare disorders in which inflammation affecting the vessel wall or the perivascular space, of both arteries and veins, is the result of an immune response precipitated, in the majority of the cases, by an unknown element. Primary and secondary vasculitis, Susac syndrome, CLIPPERS, neurosarcoidosis, and immunoglobulin G4-related disease, included in this category, frequently manifest with very similar clinical and laboratory features. Clinical neuroradiology, with imaging findings incorporated in several of the diagnostic criteria, plays a pivotal role for establishing the diagnosis, serves as guidance for additional examinations during the diagnosis work-up, and enables monitoring disease evolution and treatment. Radiological evaluation using brain MRI is the rule, but, in many cases, diagnosis requires the combination of diverse radiological techniques, mainly those ones allowing assessment of brain vessels such as CT Angiography (CTA), MR Angiography (MRA), or Digital Subtraction Angiography (DSA), or those that can add valuable information to exclude other diagnosis like spinal MRI or CT and MRI of other organs. Nevertheless diagnosis of these disorders is for both clinicians and radiologist difficult and requires a multidisciplinary approach with extensive clinical, radiological, and laboratory evaluation and frequently tissue biopsy. Inflammatory and immunologically mediated vessel diseases (IIMVD) include a wide spectrum of entities in which inflammation affecting the vessel wall or the perivascular space, of both arteries and veins, is the result of an immune response. The triggering element precipitating this immune response, factors that determine location, type, and size of vessel involved and precise pathogenesis, is, in the majority of the cases, unclear. In primary and secondary vasculitis, the main pathological feature is the presence of inflammation and fibrinoid necrosis in the vessel wall, Susac syndrome is considered to be an endotheliopathy, CLIPPERS pathology reports perivascular infiltration, neurosarcoidosis (NS) is characterized by the presence of granulomas but vasculitis can also occur, and tissue biopsy in immunoglobulin G4-related disease (IgG4-RD) shows consistently presence of obstructive phlebitis. They represent a group of relatively rare diseases, difficult to diagnose and to distinguish from each other, due to the wide overlap in their clinical presentation and radiological features, the nonspecific laboratory findings at initial general blood and CSF analysis, and the absence of specific biomarkers. Clinical presentation accompanied by a detailed medical and family history and physical examination are essential elements to establish the clinical suspicion of an IIMVD. The diagnostic work-up includes laboratory analysis and neuroimaging, commonly brain MRI, frequently combined with other imaging modalities, CT Angiography (CTA), MR Angiography (MRA), Digital Subtraction Angiography (DSA), Ultrasound (US), as well as Positron Emission Tomography (PET) commonly co-registered with CT (PET-CT). Definitive diagnosis frequently requires tissue biopsy and exclusion of other diagnosis, most commonly lymphoma, lymphomatoid granulomatosis, disseminated malignancy, autoimmune-demyelinating idiopathic disorders, histiocytosis, and other noninflammatory vasculopathies. Clinical and radiological findings, imaging and diagnostic strategies, and treatment when no specific clinical disorder is suspected will be covered in the first part of this chapter. Pathology, pathophysiology, and demographics as well as clinical and radiological findings of particular disorders included in this chapter will be covered throughout its different sections. IIMVD may appear with similar clinical presentation compared with other entities consisting of headaches, encephalopathy, focal or multifocal neurological deficits that will depend on the affected cerebral of spinal cord structures, cognitive deficits, and psychiatric features. Particular clinical presentations that are considered to be suggestive of IIMVD are summarized on Table 1. Routine laboratory blood and CSF analysis are generally normal or may show signs of inflammation. Clinical course is not specific and range from acute to subacute, progressive chronic, or relapsing remitting. Systemic features such as fever, malaise, night sweat, arthralgia, presence of skin abnormalities, and symptoms related to dysfunction of other organs should be searched, as their presence will help narrowing the differential diagnosis. 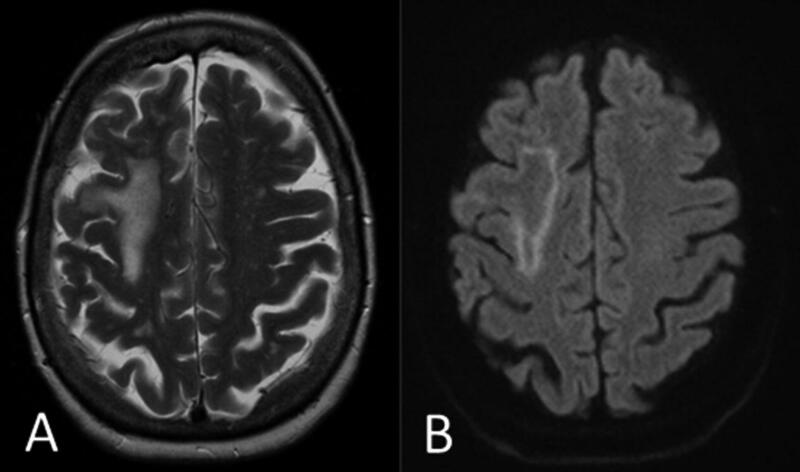 Although CT may be used in the emergency setting in patients presenting with acute neurological deficits, initial radiological examination when an IIMVD is suspected is commonly a brain MRI. MRI protocol should allow recognition of features that support the diagnosis of IIMVD, serve as guidance for further investigations when IIMVD is suspected, and exclude other diagnosis, including noninflammatory vessel disease, nonvascular inflammatory autoimmune disease, and other pathology such as tumors, infections of metabolic disorders, which can present with similar clinical symptoms. If a specific disease is suspected, dedicated MRI protocols design for demonstrating specific MRI features should be performed and will be discussed on the different sections of this chapter. The initial clinical findings are commonly nonspecific and do not support a specific diagnosis, and in this situation it is essential to perform an adequate MR imaging protocol, as shown below (Standard IIMVD protocol). Inclusion of contrast-enhanced T1-weighted sequences and at least one angiographic sequence is highly recommended. * Should be adapted to the suspected pathology (will be discussed throughout the different sections included in this chapter) and may be performed at initial MRI or a later stage during diagnostic work-up for more detailed characterization of findings. T1-weighted sequences enable the identification of areas containing subacute blood products, cortical laminar necrosis, and focal parenchymal lesions. In addition, the sequences will be used for comparison with contrast-enhanced T1-weighted sequences. T2-weighted images serve for the detection of infarcts, hypoxic-ischemic and gliotic or demyelinating changes in the brain parenchyma. Compared to T2-weighted, FLAIR sequences are superior to depict parenchymal lesions bordering the cerebral spinal fluid (CSF) and those located in the subarachnoidal spaces. 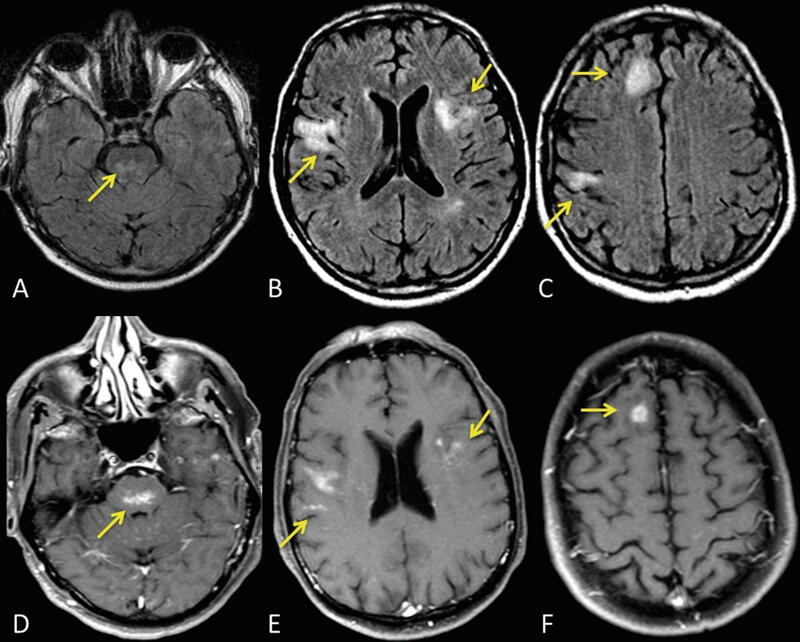 DWI allows detection of acute infarcts and differentiation between acute and old lesions, and SWI or GRE sequences are useful for demonstrating the presence of macro- or microbleeds. 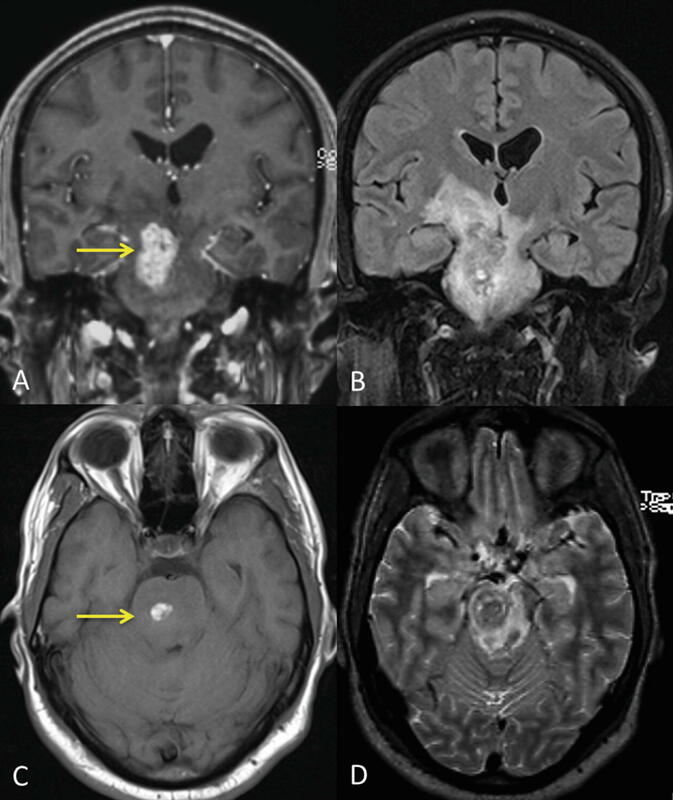 Dural, epidural, or leptomeningeal enhancement and/or parenchymal enhancing lesions can be identified on contrast-enhanced T1-weighted series (preferably with fat saturation technique). When large vessels are involved, postcontrast series may show vessel wall thickening and enhancement. MRA-TOF sequences may provide luminal information, such as arterial stenosis, occlusion, and dilatation, but has a limited resolution in the evaluation of most of the intracerebral vessels, and therefore, if small vessel vasculitis such as Susac or CLIPPERS are initially suspected, this sequence can be spared. If a vasculitis is consider to be the most probable diagnosis, contrast-enhanced high-resolution intracranial MR vessel wall imaging, preferably at 3T field strength, will improve visualization of vessel wall thickening and enhancement. MR perfusion (dynamic susceptibility contrast or arterial spin labeling techniques) may allow detection of parenchymal perfusion defects, and DTI may add valuable information about axonal integrity. Spinal imaging is usually not performed for initial radiological evaluation, unless presence of spinal cord symptoms, but may be performed during diagnostic work-up to narrow the differential diagnosis. *To avoid excessive scan time spinal MRI may be performed after post contrast brain series if brain and spine are schedule on one session. Radiological evaluation requires often the combination of several imaging modalities, including ultrasound (US), DSA, or CTA, if a vasculitis is suspected; PET or PET-CT in search for a favorable location for biopsy, and CT or MRI of other organs to support systemic disease. There are no pathognomonic MRI findings for IIMVD, although MRI may show certain patters on T2-weighted and contrast-enhanced T1-weighted sequences, especially when combined, which may point towards the diagnosis of an IIMVD (Table 2). Some of these patterns are nonspecific and some might be very characteristic for a specific disorder. Presence of associated micro-/macrohemorrhages or venous sinus thrombosis (Behçet, PACNS). Presence of lesions in structures often visible on brain MRI such as the orbit and the parotid gland (NS, IgG4-RD), paranasal sinuses (Wegener), lacrimal glands (Sjögren, IgG4-RD), pituitary stalk (IgG4-RD), or mediastinal lymph nodes (NS) when spinal MRI is performed. Location of the most prominent findings. An infratentorial location is more commonly seen in CLIPPERS or Behçet. Combination with demographic, especially age may help. Differential diagnosis in children and adolescents includes polyarteritis nodosa (PAN), Kawasaki, and postinfectious vasculitis. Given the difficulty in diagnosing IIMVD, a multidisciplinary approach is necessary. In presence of neurological symptoms suspect of an IIVMD, a detailed anamnesis, medical history, physical examination followed by general blood and CSF investigations, and neuroimaging, usually MRI, are mandatory. Results will guide further radiological studies (Table 3), laboratory analysis, and management of the patients, yet biopsy may be often necessary to achieve a final diagnosis. MRI technique: Anatomical area covered (brain, spinal cord), field strength, type of sequences performed (specific imaging protocol), type and dose of contrast agent used. Degree of assessment (optimal, suboptimal). Any incidental or unexpected finding should be clearly described and interpreted as either clinically relevant or nonsignificant. MRI conclusion: Based on the combination of demographic characteristics, clinical picture findings and MRI findings, the most probable category of disease (IIMVD) and if possible a particular disorder within this category should be mentioned together with most common differential diagnosis. Relevant findings that do not support the clinical suspicion should be described as well. Finally, recommended additional investigations should be included in the conclusion. IIMVD are associated with significant morbidity and mortality rates. Although some deficits might be not reversible, in most cases early and aggressive treatment can rapidly control the symptoms and improve the outcome. Treatment includes in the majority of the cases the use of steroids and/or immunosuppressive therapy, and MRI is one of the tools that can monitor the response of the inflammatory component to these treatments. Treatment should be continued until sustained resolution occurs, as assessed by means of MRI. Absence of response or worsening should always alert for an alternative diagnosis. Recurrent of inflammation can occur when lowering treatment doses and constitutes an indication for imaging. As these groups of diseases may relapse, prolonged immunosuppressive treatment may be necessary and treatment-related complications may occur. In this setting, if a patient presents with new neurological symptoms, focus will not only be the detection of new disease-related findings but also the early detection of therapy-related complications such us opportunistic infections, being progressive multifocal leukoencephalopathy (PML) (Fig. 1), and fungal infections some of the most severe. Standard monitoring protocols or monitoring biomarkers are not available for this category of disorders. As treatment and monitoring are very similar within the different entities included in this groups, this section will not be discuss further in the different sections. Vasculitis represent a group of diseases defined by the presence of inflammation and necrosis of blood vessel wall, involving arteries and veins. Its pathogenesis is unclear, the role of immune response vascular damage varies with the disease, and a triggering factor is in the majority of the cases still unknown. Vasculitis can involve large, medium-sized, small, and variable-sized vessels of both the peripheral and central nervous systems, leading to stenosis or occlusion, microaneurysm formation, or rupture of the vessels, resulting in various types of neurological dysfunction and imaging findings secondary to focal or multifocal infarction, diffuse ischemia, or hemorrhage. Cerebral vasculitis can occur as a disorder restricted to the CNS or in the context of a systemic inflammatory process, systemic autoimmune disorder, connective tissue disease, infections, neoplasia, drug abuse, or radiation therapy. Diagnosis is complex and includes extensive clinical and paraclinical examinations and often requires biopsy. Treatment includes the use of steroids and/or immunosuppressive therapy. Vasculitis can be classified according to its cause, location, and size of affected vessel or neuropathological findings. The classification from the 2012 Revised International Chapel Hill Consensus Conference on Nomenclature of Systemic Vasculitides (Table 4) is the most widely used (Jennette et al. 2013). This classification includes primary isolated CNS vasculitis, primary systemic vasculitis with CNS involvement, and secondary vasculitis as complication of classically nonvasculitic systemic disorders. Large vessel vasculitis affects the aorta and its main branches, and the vertebral, basilar, external carotid, internal carotid, A1 segment of anterior cerebral (ACA), M1 segment of medial cerebral (ACM), and P1 segment of the posterior cerebral (PCA) arteries. Medium-vessel vasculitis involves cerebral arteries distal to the bifurcation of the MCA, as well as the anterior and posterior communicating arteries. Small-vessel vasculitis affects arterioles, venules, and capillaries (Wengenroth et al. 2013). CNS vasculitis is rare. Their incidence and demographics varies significantly among types of vasculitis and in many cases is not clearly documented. The majority of the CNS vasculitis affects with equal frequency men and women, although there is a clear female preference in SLE and Sjögren, whereas Behçet has been more commonly described in males. CNS vasculitis tends to affect more often adults. In general CNS vasculitis occurs in Takayasu and SLE at a younger age than PACNS, PAN, or GCA. Kawasaki vasculitis, IgA vasculitis, and vasculitis related to infection (acute septic meningitis and Varicella Zoster) tend to affect children. The triggering element initiating and driving this inflammatory response is unknown. Inflammation of the wall vessel with obstruction of the vessel lumen, increased coagulation, and alterations in vasomotor tone causing hypoxia and/or ischemia lead to the clinical manifestations. 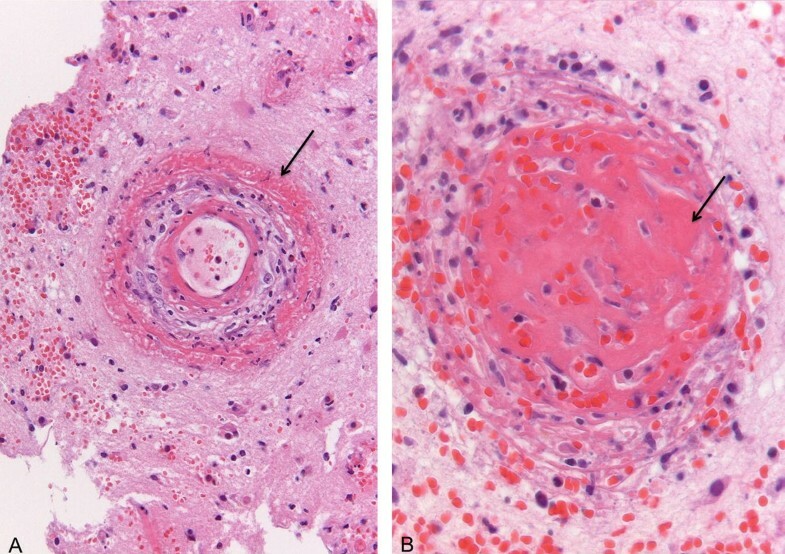 The pathological hallmark in vasculitis is an inflammatory infiltrate within the vessel wall, associated with destructive mural changes (fibrinoid necrosis) (Fig. 2). Histological changes allow classification of vasculitis according to the presence or absence of granulomas, antineutrophil cytoplasmic antibodies (ANCA), immune complex deposits in the vessel wall, and/or the size of the vessel implicated, while clinical history and systemic associated disease are necessary for final classification. Diagnosis is challenging since almost any clinical picture can occur. The CNS may be affected by vasculitis with variable frequency depending on the disease and, although some entities may manifest with some particular features (Tables 7 and 8), the neurological presentation may be quite similar among different types of vasculitis. Damage results from focal, multifocal, or diffuse vascular injury affecting any part of the CNS and leading to signs of symptoms of dysfunction including cognitive deterioration, psychiatric symptoms, focal deficits, transient ischemic attacks, stroke, and headaches. Particular clinical scenarios suggestive of CNS vasculitis are summarized in Table 1. Presence of general systemic features such as fever, night sweats, or more specific disease-related systemic features are helpful in narrowing the differential diagnosis. An alternative clinical setting in which the patient is already known with a systemic inflammatory disorder, connective tissue disease, infection, or malignancy is possible. In those cases, if neurological symptoms are present, examinations will aim to demonstrate that a CNS vasculitis is the cause of them. The clinical course is commonly acute (headaches, seizures, and stroke-like events) or subacute (encephalopathy, progressive cognitive changes), but chronic progressive presentations and spontaneous relapses and remissions have been described. Laboratory findings related to an acute inflammatory response are common. Once a vasculitis is suspected, extensive blood and CSF analysis are mandatory for further characterization. CT and MRI may show similar findings in CNS vasculitis, but MRI has a higher sensitivity in revealing parenchymal changes. 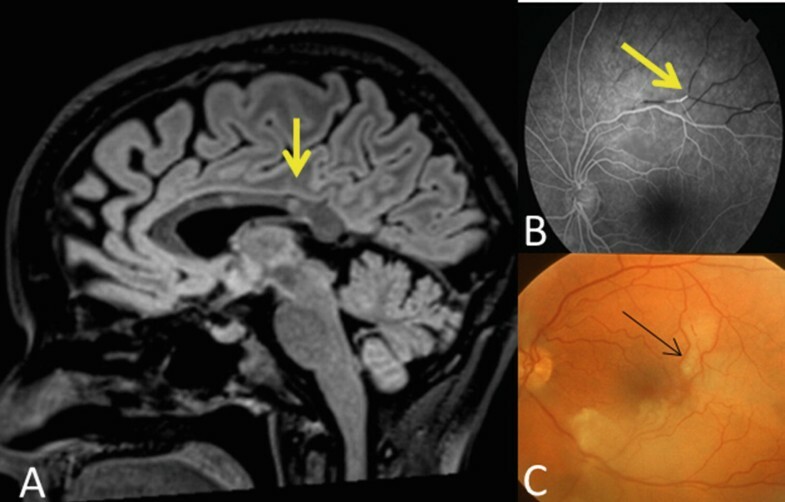 On imaging, diverse diseases coursing with CNS vasculitis shared common parenchymal findings, such as focal or diffuse hypoxic-ischemic changes, combination of new and old infarcts with sometimes coexistence of micro- or macrohemorrhages, and leptomeningeal or parenchymal enhancement (Fig. 3). Findings related with vessel wall inflammation that can be demonstrated with US, CTA, MRI/MRA, or DSA (Fig. 4) can also be presented. Focal or more commonly multifocal stenosis with areas or localized dilatation and sometimes occlusions are typical findings in vasculitis. Circumferential thickening and enhancement of vessel wall may be demonstrated on contrast enhanced T1-weighted sequences or when using MR intracranial vessel wall imaging (IVWI) techniques. Common imaging findings on CT/CTA, MRI/MRA, and DSA are summarized on Table 5. Some particular radiological findings that may be present in the different types of vasculitis like presence of venous thrombosis or pachymeningitis are highlighted in Tables 7 and 8. The purpose of imaging is the assessment of parenchymal and vascular, both luminal and vessel wall, changes that support the diagnosis of a vasculitis and the exclusion of vasculitis mimickers. 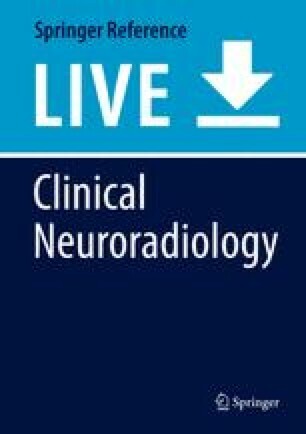 Although CT may be used in the emergency setting in patients presenting with acute neurological deficits, MRI, including MRA, is the most commonly used neuroimaging modality when a vasculitis is suspected. US and CTA have been shown useful for the evaluation of vessel lumen changes and vessel wall pathology, especially in large vessel vasculitis. 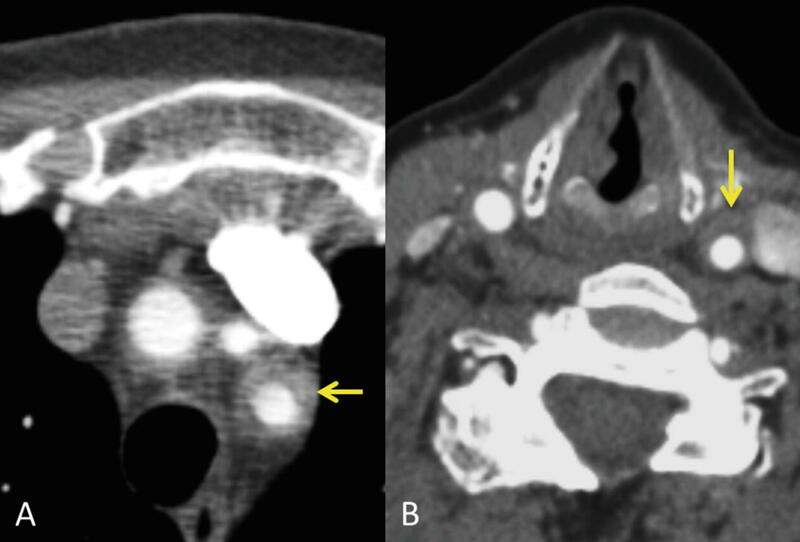 Since both CTA and MRA have a limited resolution, DSA is still performed, especially when medium-sized and small vessel vasculitis are suspected. 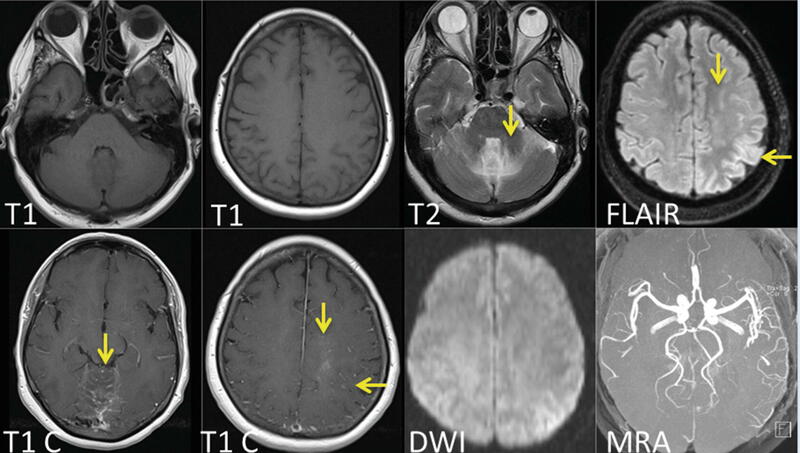 In contrast with DSA where vessel wall changes are not evaluable, thickening and multifocal homogeneous, smooth, intense, and concentric enhancement of the vessel wall can be demonstrated with MRI when using intracranial vessel wall imaging (IVWI) sequences (Mandell et al. 2012). Recommended dedicated MRI protocol in vasculitis is similar to the one recommended for IIVMD but should include high resolution vessel well imaging if available. Radiological evaluation almost always includes de combination of several imaging modalities which varies depending on patient condition, type of vasculitis suspected, available MRI technology, and radiological expertise. The most commonly used combinations are MRI/MRA followed by DSA, as well as CTA followed by DSA in cases of large vessel vasculitis. US has a role in detecting hypoechoic edematous wall swelling (halo sign) in the temporal artery in patients with GCA. FDG-PET or PET-CT is very sensitive in detecting large vessel inflammation and in identifying a favorable location for biopsy. Diagnostic criteria are available for several vasculitis and often require pathological confirmation, nonetheless radiological findings may support the diagnosis if biopsy is not feasible. PACNS is an uncommon single-organ vasculitis, representing less than 2% of vasculitis cases involving the CNS. Although described in children and elderly, it usually manifests at the fifth decade affecting equally frequent men and women. The pathogenesis is unknown. Typically involves small- to medium-sized vessel (both arteries and veins) mainly those in a leptomeningeal or subcortical location, with a focal and segmental distribution. In most cases the underlying histopathology is granulomatous. Clinical presentation is nonspecific, most commonly patients present with subacute clinical manifestations of CNS dysfunction, frequently including headache and cognitive impairment. Focal symptoms appear later in the disease. Intracranial hemorrhage, spinal syndrome, and constitutional symptoms (fever, weight loss) are infrequent, and there is lack of generalized inflammation. Laboratory test is nonspecific. MRI is highly sensitive (>90%) however not specific (Hajj-Ali and Calabrese 2014). Cortical and subcortical infarctions, parenchymal and leptomeningeal enhancement, intracranial hemorrhage, tumor-like lesions, and increased signal intensity on T2-weighted sequences are often seen (Fig. 5). DSA may occasionally show alternating segments of stenosis with normal and dilated intervening segments and arterial occlusions. Findings are usually bilateral and are nonspecific and possibly present in other nonvasculitic diseases (vasospasm, CNS infection, reversible cerebral vasoconstriction syndrome-RCVS, and atherosclerosis). Leptomeningeal or parenchymal biopsy remains the standard of reference for the diagnosis of PACNS, but DSA supports the diagnosis when biopsy is not undertaken or results are negative. Exclusion of other vasculitis and nonvasculitis disorders is also mandatory for establishing the diagnosis of PACNS (Salvarani et al. 2012). Reversible cerebral vasoconstriction syndrome (RCVS) is the most common mimicker from PACNS and its differentiation is important because prognosis and treatment requirements differ. In the absence of validated diagnostic criteria (Calabrese et al. 2007), several clinical, laboratory, and imaging characteristics may be useful to distinguish RVCS from PACNS (Table 6). CNS involvement occurs with variable frequency in vasculitis, and although most of CNS vasculitis share many clinical and radiological findings, some of them also may manifest with characteristic systemic or neurological features that are useful for establishing the diagnosis. Table 7 includes detailed information about histopathology and demographics and highlights some of the most relevant clinical and radiological features of large-, medium-sized vessel, small-sized vasculitis, and variable sized vasculitis. Diagnostic criteria for the various vasculitis are available in many instances. Systemic inflammatory autoimmune disease may manifest with CNS vasculitis. Involvement of CNS is very variable and related with vasculitis but also with nonvasculitic vasculopathy. In the majority of the cases, the presence or systemic inflammatory disease with presence of extracranial manifestation are the clue for the diagnosis. Table 8 highlights the main clinical and radiological features of the vasculitis included in this group. This section includes vasculitis associated with a variety of infections, malignancies, drug, and radiation vasculitis. Table 8 highlights the main clinical and radiological features of the vasculitis included in this group. Increased vessel thickness in large vessel vasculitis with wall edema. 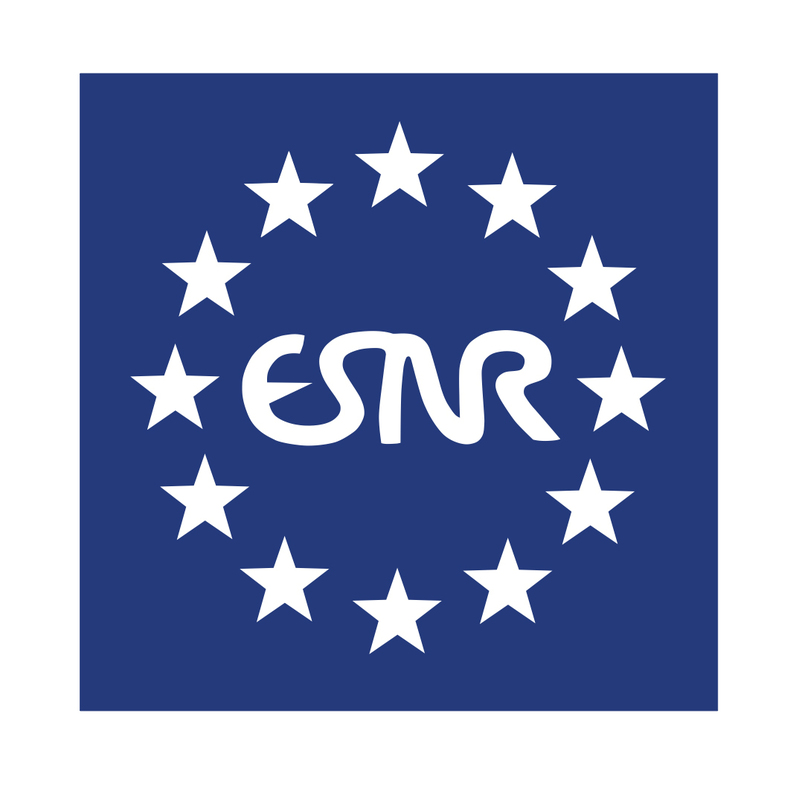 MRI Conclusion: The radiological impression supporting or excluding the diagnosis should be mentioned in the conclusion. Relevant findings that do not support the clinical suspicion and point towards other disease category as well as advice on additional investigations should be part of the conclusion. Retinocochleocerebral vasculopathy; SICRET syndrome (small infarction of cochlear, retinal and encephalic tissue syndrome); RED-M (microangiopathy with retinopathy, encephalopathy, and deafness). Susac Syndrome (SS) is a rare disease characterized by the clinical triad of encephalopathy, including focal or multifocal neurological manifestations, psychiatric features and headache, hearing loss and branch retinal arterial occlusions (BRAOs) that affect mostly middle-aged women. The clinical triad is considered to be pathognomonic; however, only a minority of the patients present with the complete triad at disease onset. From unknown etiology, it is most likely an autoimmune-mediated endotheliopathy that affects the microvasculature (precapillary arterioles) of the brain, retina, and inner ear leading to ischemia. MRI, retinal fluorescein angiography, and audiometry are important to establish the diagnosis. Differential diagnosis with other neurological, ophthalmological, and otological entities is challenging. Although some damage may be irreversible, early diagnosis allowing early and aggressive therapy with administration of immunosuppressive is crucial for clinical improvement or recovery. SS is an infrequent disease and very limited epidemiological data are available. The true incidence is unknown being the number of reported SS in the literature slightly above 300. SS affects women 3–4 times more frequently than men and the first symptoms usually manifest between 20 and 40 years of age. Only 13% of the patients present initially with a complete triad of symptoms with a reported mean delay of 5–7 months between the first symptoms and the developing of a complete clinical triad. In some series, men present with the complete triad of symptoms more often than women, suggesting that although more prevalent in females is probably more severe in males (Greco et al. 2014). SS is probably an immune-mediated endotheliopathy leading to the damage and inflammation-related occlusion of the microvasculature (precapillary arterioles) of the brain, retina, and inner ear. SS pathophysiology is still unclear. Antiphospholipid and/or antiendothelial cell antibodies may play a role in endothelial cell injury in SS, but other entities such as idiopathic vasospasm, hypercoagulable phenomena, and viral infection also might play a role (Greco et al. 2014). Some reports have linked SS with pregnancy and hormonal therapy. Brain biopsy material shows perivascular inflammation of small vessels and microinfarcts. Arteriolar wall proliferation, lymphocytic infiltration, and basal lamina thickening are present, but in contrast with vasculitis, absence of necrosis in the vessel walls is the rule. Capillary occlusion has also been reported involving the leptomeninges, retina, apical turns of the cochlea, and semicircular canals. The classical clinical presentation consists of encephalopathy, visual disturbances, and sensorineural hearing loss (Susac et al. 2007). Headaches, including migraine-like and oppressive headaches, most likely related with damage to leptomeningeal vessel, are a very frequent symptom in SS and may occur up to 6 months before the onset of other symptoms. A variety of additional neurological acute deficits or subacute findings may develop, including cognitive dysfunction and psychiatric symptoms. MRI brain is the modality of choice for demonstrating brain involvement (Fig. 8). Visual disturbances, most commonly, scotoma and photopsia, are secondary to branch retinal artery occlusions (BRAOs), which may be extensive or subtle, unilateral, or bilateral and should be documented by fluorescein angiography (FLA) or funduscopy. Other retinal ophthalmological findings are briefly summarized on Table 9. Sensorineural hearing loss, caused by occlusion of the apical cochlear arterioles and those of the semicircular canals, typically affects low or middle frequencies and tends to be bilateral and asymmetric. Presentation can be sudden and hearing loss may be mild and insidious or may be fluctuating and suggestive of Meniere’s syndrome. Hearing loss should be objectified by audiogram. Table 9 shows other otological findings that may be present in SS. Laboratory test is not specific and there are no serological biomarkers. Nevertheless serum and CSF are necessary to exclude differential diagnosis. In SS involvement of the corpus callosum is the rule. The most characteristic MRI abnormality is the presence of T2/FLAIR hyperintense roundish lesions (snowballs) in the central portion of the corpus callosum best recognizable on sagittal T2-weighted or FLAIR images (Susac et al. 2003) and sometimes involving its entire thickness. These snowballs result in residual holes, especially in the splenium of the corpus callosum. Linear defects of the corpus callosum (spokes) or wedge-shaped lesions extending from the roof of the corpus callosum are also commonly seen. Focal T2 lesions in the white matter (periventricular, subcortical, and centrum semiovale) are very frequent and involvement of the gray matter is a common finding (above 70%). MRI may show multiple microinfarcts and lacunes in different stages, some of them with diffusion restriction and contrast enhancement. Leptomeningeal enhancement can be seen in up to 30% of the cases, while parenchymal enhancement has been described in 30–70% of cases. Atrophy of the corpus callosum and mean fractional anisotropy reduction in the genu of the corpus callosum have been documented. Enhancement of nerve roots in the cauda equine has been documented in patients with SS presenting with cauda syndrome. Figure 9 illustrates radiological findings in SS. Differential diagnosis includes a wide range of pathologies including most commonly MS. Most important differential features are compiled on Table 10. Other entities to consider in the differential diagnosis in SS include acute disseminated encephalomyelitis (ADEM), vasculitis of the CNS, and infectious encephalitis. To prevent misdiagnosis and delayed treatment, criteria for definitive, probable, and possible diagnosis of SS have been proposed by the European Consortium of Susac syndrome (Kleffner et al. 2016). 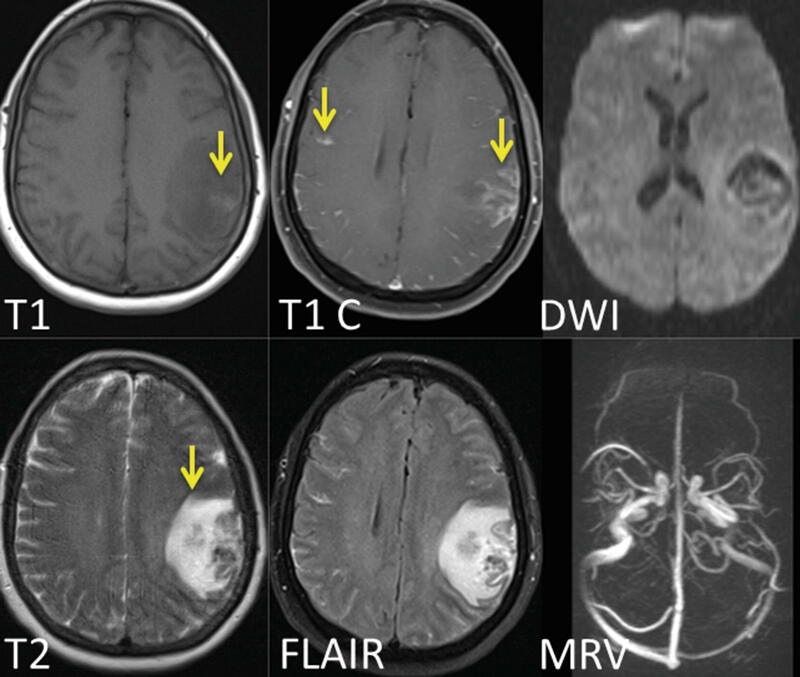 From a radiological perspective, it is important to underline that the presence of typical findings on cranial MRI, hyperintense, multifocal, round small lesions, at least one of them in the corpus callosum (“snowball”) on T2-weighted sequences are included in the diagnostic criteria and are mandatory to establish the diagnosis of definite Susac syndrome. MRI is the modality of choice when a SS is suspected though CT may be performed in emergency setting in patients presenting with acute symptoms. Sagittal FLAIR images, essential for the recognition of lesions centrally located in the corpus callosum, T2-weighted sequences, for demonstration of gray matter involvement, and DWI, for assessment of acute ischemia, should be included in the MRI scan protocol. 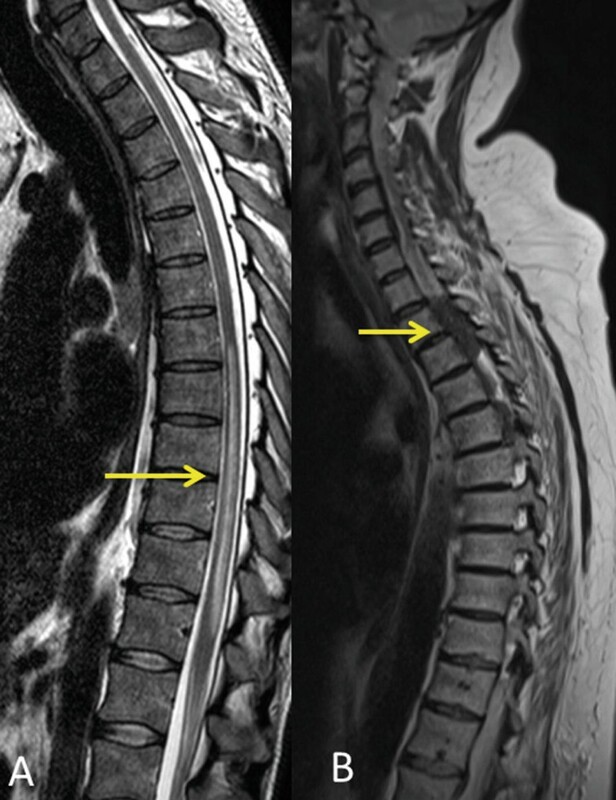 Additional spinal imaging is required if patients present with spinal cord or cauda syndrome as well as if the differential diagnosis with MS or other disorders is unclear. If spinal imaging is indicated, MRI protocol should include sagittal T2-weighted or T2/PD-weighted or STIR, and contrast-enhanced T1-weighted sequences. DSA is not indicated since the arterioles involved are too small to be visualized on angiograms. MRI conclusion: A final conclusion should always be included in the report. Level of suspicion of the findings being related to SS, differential diagnosis, and/or additionally investigations when necessary should be mentioned. Chronic lymphocytic inflammation with pontine perivascular enhancement responsive to steroids. CLIPPERS is a recently described relapsing-remitting inflammatory CNS disorder of unknown etiology predominantly affecting the brainstem and cerebellum with or without involvement of supratentorial structures such as basal ganglia, thalamus, corpus callosum, cerebral white, and spinal cord. Clinically is characterized by subacute onset of symptoms related to brainstem, cranial nerve, and cerebellar involvement and radiologically, on MRI, by the presence of punctate and curvilinear gadolinium enhancement “peppering” the pons (Pittock et al. 2010). There are no serum or CSF biomarkers. Diagnosis is difficult and includes extensive investigations to rule out other diseases, including lymphoma, vasculitis, and other immunological disorders. It is a treatable disorder characterized by clinical and radiological response to corticosteroids. Whether CLIPPERS represents a separate new disease or a syndrome with various etiologies is still unclear. Epidemiological data are scarce, to date only a few cases of CLIPPERS have been described in the literature. Available data show that the usual age of onset of symptoms is in midlife, with a wide range from 16 to 86 years, and there is no clear gender predilection. Although the pathophysiology of CLIPPERS remains unknown, the pathological features, CSF findings, and the clinical-radiological responds to steroids suggest an autoimmune-mediated or other inflammatory pathogenesis (Dudesek et al. 2014). Its predilection for brainstem involvement remains unclear. Pathology of biopsy specimens from CLIPPERS patients shows a perivascular (from both small arteries and veins) infiltration compose of predominantly of CD3+ and CD4-positive T cells, histiocytes, and activated microglia accompanied frequently by parenchymal diffuse infiltration most commonly in the white matter and occasionally in the gray matter and leptomeninges. Monoclonal or atypical lymphocyte population or characteristic histological features of vasculitis and/or granulomas are absent (Simon et al. 2012). Although no specific, the histopathological findings on biopsy may add final support to the diagnosis but most importantly may exclude alternative diagnosis. In CLIPPERS the onset of symptoms tends to be subacute and the clinical course is relapsing-remitting. The most common clinical presentation is a subacute onset of ataxia and dysarthria. In fact, ataxia and dysarthria are so typical that their absence should be considered nonclassic for CLIPPERS (Dudesek et al. 2014). A wide range of other symptoms related with brainstem, cranial nerve, and cerebellar involvement may occur and present in various combination or more rarely in isolation. Other features related to long tract affections and/or spinal cord syndrome, pseudobulbar symptoms, cognitive dysfunction headaches, and fatigue have been described (Table 11). Clinical improvement of resolution when treated with steroids is one of the hallmarks from this entity. Lack of improvement or worsening should be considered an alert feature that points against CLIPPERS. Symptoms may relapse when withdrawing steroid treatment. Blood and CSF investigations are nonspecific. Mild pleocytosis, mildly elevated protein, and/or CSF oligoclonal bands may be present. Laboratory tests aim to rule out evidence of specific inflammatory, demyelinating, infectious, neoplastic, paraneoplastic, or vasculitic disorders. MRI features are incorporated in the definition of CLIPPERS. The signature finding is the presence of multiple punctuate or curvilinear enhancement peppering the pons with or without involvement of the cerebellar peduncles and cerebellum (Fig. 10). The enhancement may extend into the cerebral hemispheres (thalamus, internal capsule, corpus callosum, basal ganglia, white matter) and spinal cord. These punctuate enhancement lesions are typically small (<3 mm), bilateral, and symmetrical distributed and do not show associated vasogenic edema or mass effect. Characteristically lesion load and size decrease as the distance from the pons increases (Pittock et al. 2010). On T2-weighted sequences lesions present as small focal or confluent lesions with mild to moderate hyperintensity and the extension is restricted to the area of enhancement. When spinal cord lesions are present, they tend to follow the same pattern as brainstem lesions. Lesions typically rapidly diminished and resolved after treatment with steroids (Fig. 11). In chronic stages, pontocerebellar and spinal cord atrophy may be observed. Findings that differ from those described above should be considered as nonclassic for CLIPPERS and an alternative diagnosis should be investigated. Differential diagnosis is large, most frequently includes vasculitis, CNS lymphoma, intravascular lymphoma, lymphomatoid granulomatosis, neurosarcoidosis, Sjögrem, and CNS demyelinating disease (Simon et al. 2012). Brain biopsy should be considered prior to treatment. Classic and nonclassic radiological findings are summarized on Table 12. Brain MRI findings are essential part for the diagnosis of CLIPPERS. T2-weighted and contrast-enhanced T1-weighted, preferably with fat suppression techniques, are imperative to depict CLIPPERS’s signature findings, but MRI protocol should be also suitable to asses other possible mimickers. Imaging of the spinal cord might help in the differential diagnosis. MRI conclusion: A final conclusion should always be included in the report. Define if the radiological findings support the diagnosis of CLIPPERS. If any nonclassic findings are present, alternative diagnosis fitting with those findings should be mentioned. Since response to corticoids is one of the features that defines CLIPPERS, follow-up MRI is mandatory. MRI protocol should include same sequences, contrast dosis, and timing for an optimal comparison. Radiological report should specifically describe if lesions decreased, resolved, increased, or changed in MRI pattern. Nonclassic response should suggest an alternative diagnosis. Sarcoidosis is a rare, multisystem granulomatous disease of unknown origin characterized pathologically by the presence of noncaseating granulomas. The respiratory and lymphatic systems are affected most frequently. When CNS is involved, neurosarcoidosis (NS), cranial neuropathy, commonly facial and optic, is the most frequently reported manifestation, but many other combination of neurological symptoms can be present depending on the site and extent of involvement. Manifestations may be monophasic, relapsing, or chronic and the onset varies from acute to a slow, progressive, or chronic evolution. MRI is the most sensitive tool, in detecting and localizing lesions. Nevertheless diagnosis requires histology and therefore one imaging goal consists in finding suitable lesions for biopsy. Despite no cure, treatment is based on use of corticosteroid and immunosuppressive therapy. Treatment monitoring will focus on detection of activity or complications related with the treatment. Subclinical CNS involvement is seen in up to 25% of patients in autopsy series, whereas clinically recognizable involvement is estimated in 5–15% of patients with sarcoidosis and usually occurs within the first 2 years of illness. In up to 70% of the cases with neurosarcoidosis, neurological symptoms are the first manifestation of sarcoidosis. NS can occur at any age and race, but it usually manifests before the age of 40 and affects, like systemic sarcoidosis, more common to African-American (Spiegel et al. 2012). NS appears to be more common in women than in men in most, but not all, series. Histopathologically sarcoidosis is characterized by the presence of noncaseating granuloma. Several etiologies have been suggested including a common environmental exposure, infectious agent, and/or abnormal immune response probably related with genetic predisposition. Granulomatous inflammation in sarcoidosis is predominantly a T-helper 1 immune response mediated by a complex network of lymphocytes, macrophages, and cytokines (Gerke and Hunninghake 2008). Involvement of the brain parenchyma is probably the result of the extension of granulomatous exudates along subarachnoidal and Virchow-Robin spaces secondary to an initial granulomatous inflammatory meningitis. Manifestation of NS are variable and depending on the site and extent of involvement, may be monophasic, relapsing, or chronic and the onset varies from acute explosive to slow progressive. Cranial neuropathy is the most frequent manifestation of NS being the facial and the optic nerve those most commonly involved. Aseptic meningitis, acute or chronic, hydrocephalous, areabsortive or obstructive, endocrinological manifestations, symptoms of space-occupying mass, seizures, encephalopathy, psychiatric disorders, a wide variety of spinal cord syndromes, peripheral and small fiber neuropathy (Hoitsma et al. 2010) may occur (Table 13). Laboratory findings are nonspecific yet CSF increased angiotensin-converting enzyme liter, and CD4:CD8 ratio and soluble interleukin-2 receptor may be helpful for the differential diagnosis with sarcoidosis mimickers. The most common radiological finding in NS is meningeal involvement. 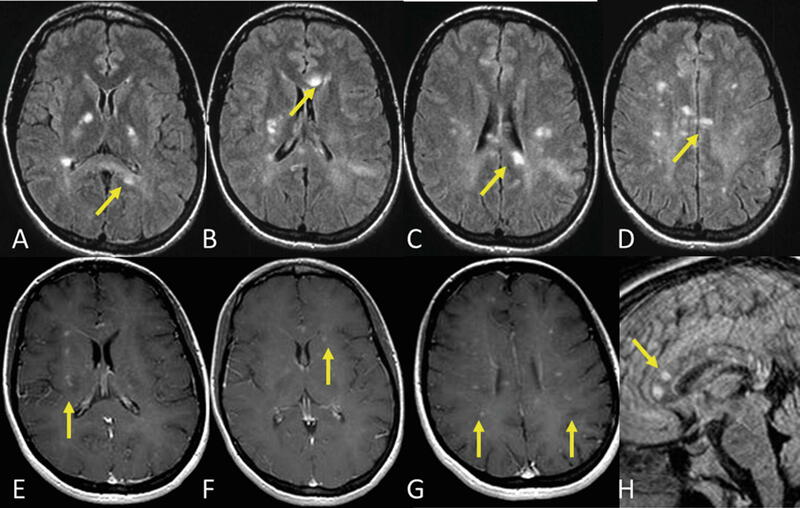 Presence of epidural masses, typically T2-hypotense, most commonly but not exclusively located in the supratentorial space, and basal meningitis are typical features in NS (Fig. 12). Enlargement and enhancement or cranial nerves and perivascular enhancement are common findings. Spinal involvement may occur (Fig. 13). Radiological features are summarized on Table 14. 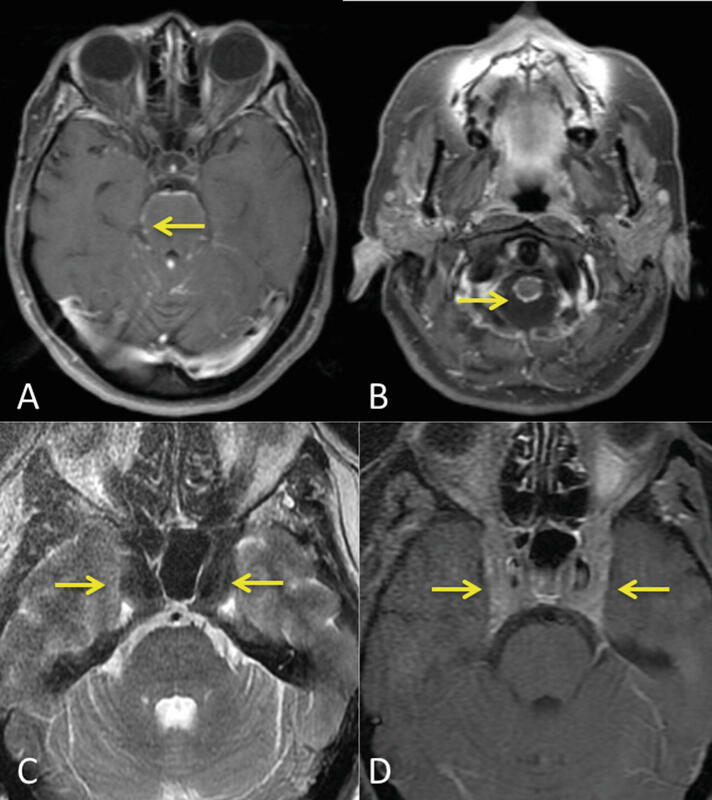 Orbital findings (thickening and enhancement of the optic nerve), temporal bone findings (thickening and enhancement of the facial nerve), hypothalamic enhancement, abnormalities in the pituitary gland, or parotid swelling are features sometimes recognizable on MRI examination thought frequently only partially scanned. MRI of the brain is the imaging modality of choice when NS is suspected and contrast-enhanced T1-weighted sequences are mandatory for lesion identification. Spinal cord should be imaged in patients presenting with spinal cord syndrome or if spinal imaging might help with the differential diagnosis. If optic nerve symptoms are the most prominent feature, imaging the orbit is indicated. Thoracic imaging using high resolution CT and PET studies may be necessary for establishing the diagnosis and identifying lesions suitable for biopsy. The diagnosis is based on three criteria: a compatible clinical and/or radiological picture, histological evidence of noncaseating granulomas, and exclusion of other diseases that may produce a similar histological or clinical picture, including tuberculosis, malignancies, vasculitis, or MS (Table 14). Myelitis (longitudinal extensive) and spinal meningeal enhancement. MRI conclusion: A final conclusion should always be included in the report. Define if the radiological findings support the diagnosis of neurosarcoidosis. In patients not known with sarcoidosis include differential diagnosis and recommendation for additional investigations. In patients known with systemic sarcoidosis, any new brain lesions should be categorized as related to sarcoidosis or to treatment complication. Immunoglobulin G4-related disease (IgG4-RD) is a recently described multiorgan, immune-mediated, fibro-inflammatory disease of unknown etiology. Histology shows a very characteristic triad of infiltration of IgG4-bearing plasmocytes, storiform fibrosis, and obliterative phlebitis, and it is accompanied by high IgG4 levels in serum. The main clinical feature is the enlargement of the affected organ. Although the more common affected organs are the pancreas (autoimmune pancreatitis), salivary and lacrimal glands (sclerosing sialadenitis/dacryoadenitis), biliary tree (sclerosing cholangitis), retroperitoneum, kidneys, thyroid gland, lungs and aorta, any organ might be affected. Neurological manifestations are uncommon and when present involvement of the meninges (hypertrophic pachymeningitis) and the hypophysis (hypophysitis) are the most frequent findings. Parenchymal brain involvement and changes secondary to associated vasogenic edema, although rare, have been described. Diagnosis requires exclusion of other etiologies and frequently biopsy. It is a treatable condition that responds to glucocorticoids. Epidemiological data are scarce. Involvement of the nervous system has been reported as rare in all the published series with pachymeningitis as the most common manifestation. It appears to have a male predominance (Baptista et al. 2017) affecting middle-age and elderly subjects. Pathophysiology is unclear, but studies suggest that IgG4 is probably not the pathogenic factor and that CD4 plays an important role in the developing of this disease. Three key histopathology features are present in IgG4-RD, lymphoplasmacytic infiltration, obliterative phlebitis, and storiform fibrosis. Obliterative phlebitis consists of partial or complete obliteration of medium-sized veins and commonly appears as an inflammatory nodule next to a patent artery. 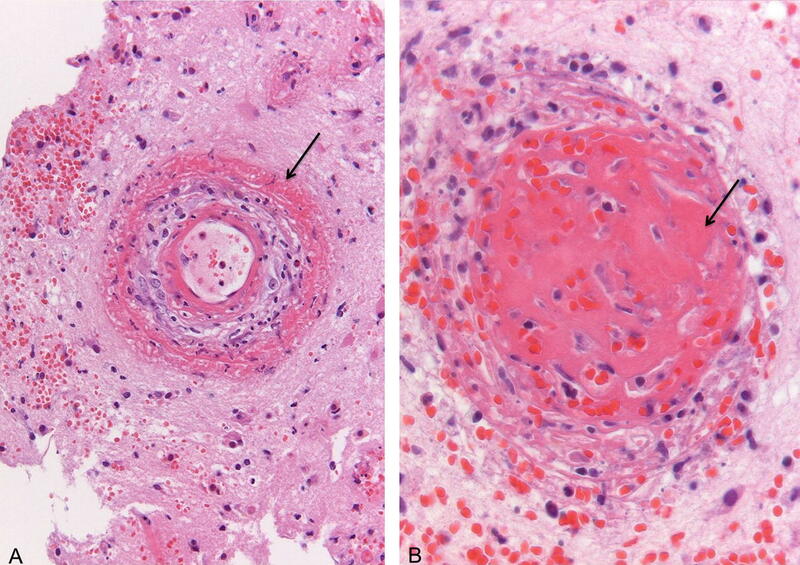 Presence of obliterative arteritis may occur with absence of vessel wall necrosis as a differential feature with vasculitis (Kamisawa et al. 2015). 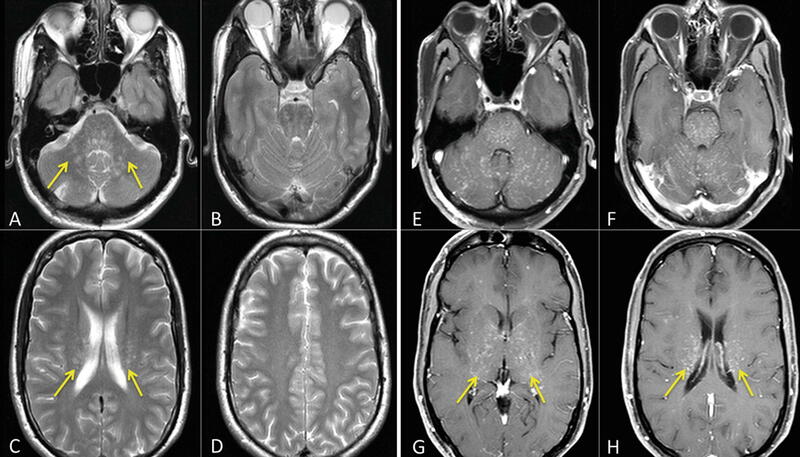 The most frequent neurological manifestations of IgG4-RD are secondary to either hypertrophic pachymeningitis, with headache, cranial nerve palsies (Lu et al. 2014), and less common vision disturbances and motor weakness, or to hypophysitis with hypopituitarism, diabetes insipida or both (Bando et al. 2013). More frequently visual disturbances are secondary to dacryoadenitis or inflammatory eye disease with presence of painless eyelid swelling (unilateral or bilateral), ocular movement restrictions, exophthalmos, ptosis, anopsia, or hemianopsia. On MRI hypertrofic pachymeningitis may manifest as focal or diffuse thickening of the pachymeninges, typically hypointense on T2-weighted sequences and enhancing, and result in compression of surrounding structures, specially cranial nerves. Involvement of the spinal nerve roots by paravertebral masses may occur and appear usually hypointense on T2-weighted sequences and show enhancement on contrast-enhanced T1-weighted images. Absence of normal T1 hyperintensity in the posterior pituitary may be identified in patients presenting with diabetes insipida. 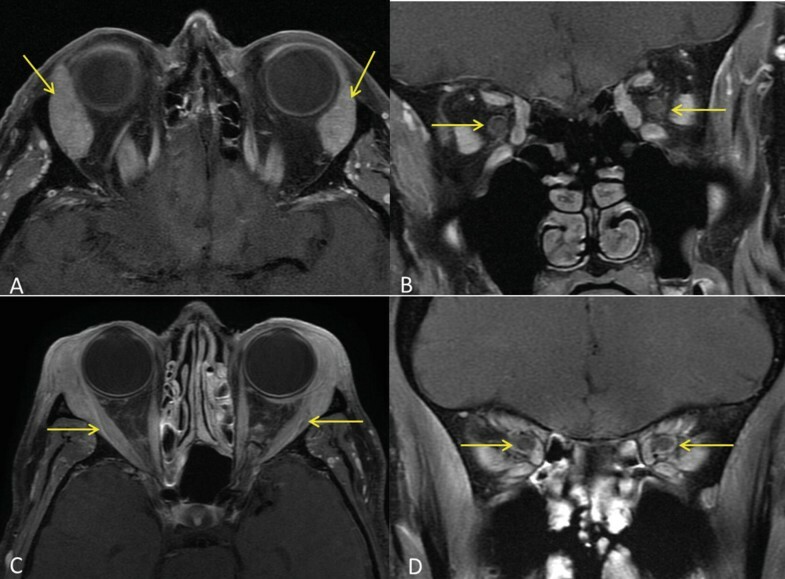 When visual disturbances are present, orbital findings with enlargement or lacrimal glands, extraocular muscles or perineural enhancement, scleritis or uveitis may be visible on brain MRI (Fig. 14). These imaging findings are not specific and many other etiologies including sarcoidosis, histiocytosis, infections, and malignancies may appear with similar radiological findings. Diagnosis requires presence of IgG4 in serum and histological confirmation. MRI is superior to CT for the evaluation of meningeal, skull base, and sellar region involvement. MRI protocol should include T2-weighted sequences, since lesions tend to show hypointense signal, and contrast-enhanced T1-weighted sequences. Imaging orbita*** including T1-weighted, T2-weighted, and contrast-enhanced T1-weighted fat suppression (axial and coronal). FDG PET-CT and gallium SPECT/CT have been described as potentially useful tools for diagnosis and monitoring of this disease. MRI conclusion: A final conclusion should always be included in the report. Define if the radiological findings support the diagnosis of IgG4-RD. In de novo patients’ alternative diagnosis according to the clinical history should be included. Patient history: 60-year-old male presented at emergency department with subacute onset of headache, dizziness, paresthesias on legs, progressive ataxia, and cerebellar dysarthria. His family and clinical history were unremarkable. CT performed at the emergency department showed a hypodense area in the cerebellum. Routine laboratory evaluation was normal. Purpose of MRI: Rule out tumoral or inflammatory pathology of the CNS. Imaging technique: A standard IIMVD was performed including MRA-TOF. Findings (figure 15): Area of low intensity in the superior vermis on T1-weighted image. Subtle areas of multifocal brain hyperintensities on T2-weighted and FLAIR sequences (cerebellum and left frontal lobe) and in the subarachnoid spaces (left parietal region). 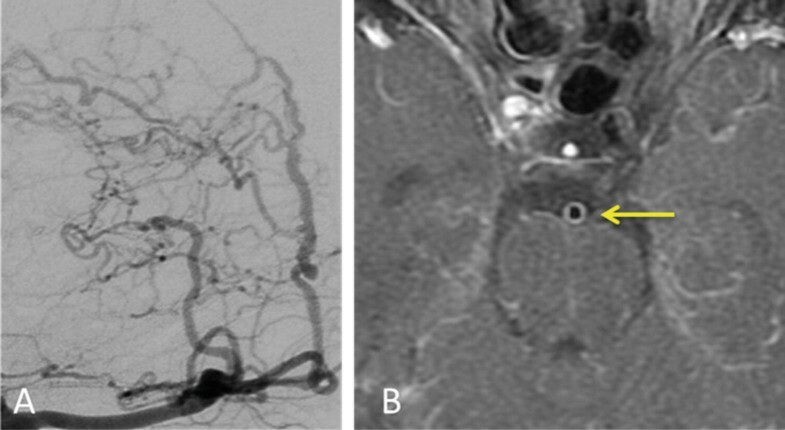 Contrast-enhanced T1-weighted sequence showed multiple areas of enhancement with variable patterns, punctiform, probably perivascular in the corona radiata and linear leptomeningeal in the superior vermis and left parietal region. Lesions did not show restriction on DWI. MRA- TOF did not show any abnormalities. Interpretation: Multifocal hyperintense T2 lesions in the supra- and infratentorial compartment combined with an enhancement pattern predominantly perivascular and leptomeningeal were considered suggestive of inflammatory vessel disease, possible vasculitis or sarcoidosis. Differential diagnosis included lymphoma or other malignancies, and infectious process. CSF analysis was recommended. Clinical course: CSF analysis showed reactive-inflammatory findings and no evidence of lymphoma. Extensive serological and microbiological analysis was required. 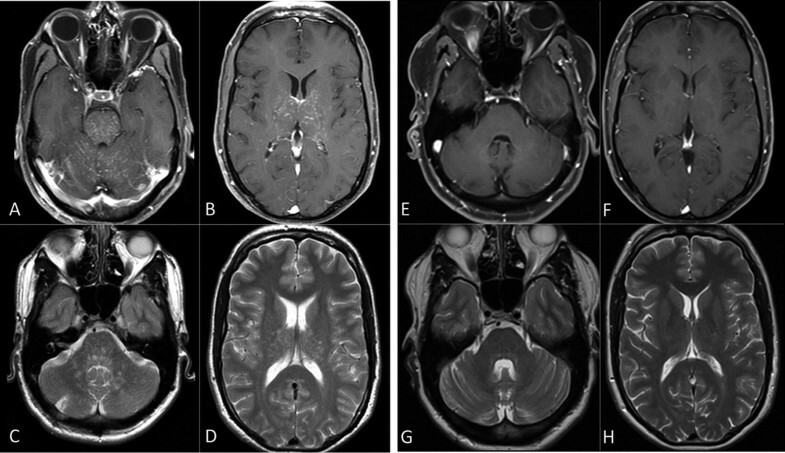 Due to clinical deterioration with the development of a new right hemiparesis and aphasia, a new MRI was performed (Fig. 16). Imaging technique: Vasculitis protocol. Additional MR venography (MRV) was performed. Findings: New area with subtle T1 hyperintensity in left fronto-parietal region, related to subacute blood products, with extensive edema, located adjacent to the area of abnormal subarachnoid signal intensity visible on previous scan, was identified. Postcontrast T1-weighted images showed increase of leptomeningeal enhancement. No abnormal vessel wall enhancement or areas with restricted diffusion were identified. MR venography showed patency of dural venous sinuses. Interpretation: Increase of abnormalities specially leptomeningeal enhancement with new subacute hemorrhagic lesion in left fronto-parietal region. No venous thrombosis was identified. Findings are suggestive of inflammatory vessel disease, possible vasculitis. Hemorrhagic lesions were considered not typical for sarcoidosis. DSA was recommended. Diagnosis: Biopsy instead of DSA was performed. Pathology showed findings consisting with vasculitis. Results of extensive serological and microbiological analysis resulted negative, and no evidence of systemic disease was found allowing the final diagnosis of PACNS.